Week 1: I mostly wore my hair loose with a Ninja Bun the first week. 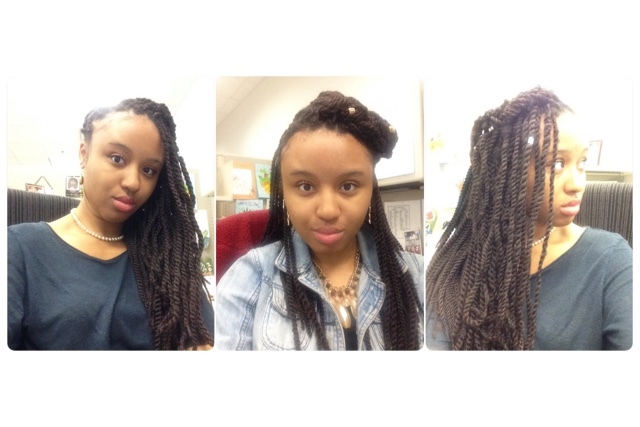 I twisted my hair pretty snug and didn't need the extra stress of styling. This was an easy style to really care for. Week 2: I started trying out different styles with my twists. 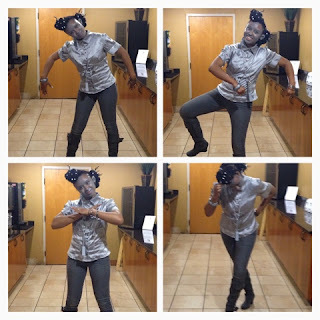 I did tuck and rolls, flat braids, and more buns to have a bit more creativity in my styles. When I had my tuck and roll style with my hair to the side, my husband called me a "hip-hop star." Now time to drop my album! 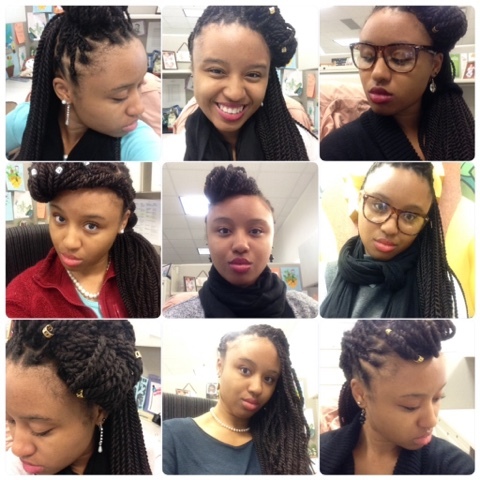 Week 3: I do more French braid styles for something different, instead of Avant Garde ones. French braids are actually nice and help keep my hands from messing with my new growth. I also massage my scalp with my coffee oil, because my scalp is starting to get that itch. That tends to help a bit. 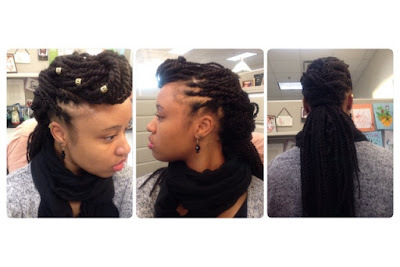 The twists are still looking very nice! Week 4: New growth is definitely coming in and I have already scheduled to take out my hair sometime in the next week. This style was so easy to care for and not a big hassle for me at all! I literally moisturize and massage my scalp with oil 3xs a week and sleep with a satin scarf. This style stayed in for 4 weeks! This hair is literally everywhere (internet and local beauty supplies) and the price is not bad either. Depending on where you buy the hair, is can be $4.99 to $9.99 a pack. Pretty cheap! 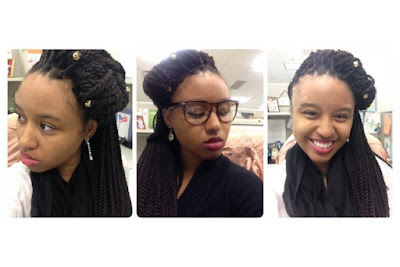 Since these are twists, there is no need to cut the hair out of your braids. Just pull and release the twists, cleanse in ACV, then pack up for next use. Although, you can still seal the ends in boiling water, it is not necessary to do so. The manufacturer did an excellent job creating the twists to not unravel. You may find tiny bits of lint at the ends, but it's not too bad nor irritating. 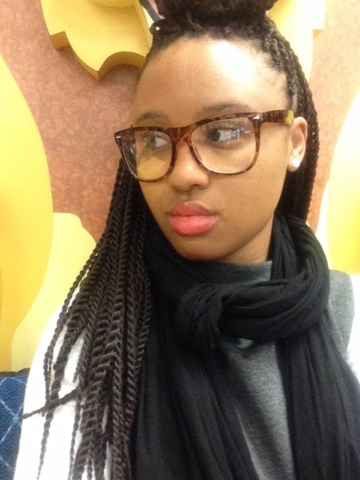 Unlike the Freetress Braid Senegalese Twists Small, the twist are thicker and have a natural feel to them. 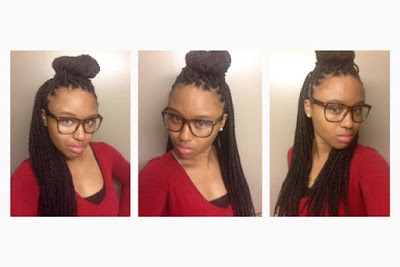 They also look natural as well, instead of shiny like Senegalese twists using kanekalon hair.